Brahma Kamal or Saussurea Obvallata (scientific name ) is rare spices of Asteraceae flowers. 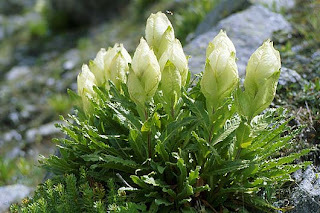 The flower is found at an altitude of above 3000 to 4500 meter in northern Himalayas (Kashmir, middle Nepal, Kedarnath, Tungnath, valley of flowers, Pindari Glacier, Shivling Base, Pawali Kanta, Santopanth, Swarg Rohini route ). The flower found in 3 types of spices in different area of Himalayas. 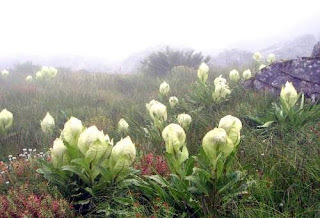 It is also the state flower of Uttarakhand in India. The flowers are hermaphrodite (have both male and female organs). The height of this flower is normally about to 70 to 80 cm with roots. 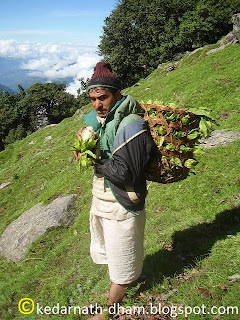 Brahma Kamal found in Vasuki Tal trek in Kedarnath valley. The flower has very religious magnificence in Kedarnath temple. The flower bloom every year in the month of August, September in Kedarnath valley. 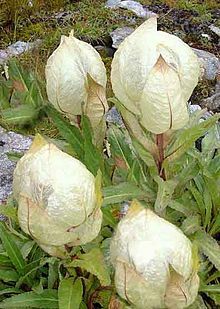 It is believed that if one devoted this flower to lord Shiva in Kedarnath temple sin remitted for 3 life cycle of that person. Thus the importance given to this flower in valley.